Trade in your old equipment for a great discount on new clubs at any of our american golf stores. 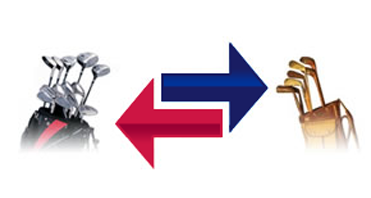 We accept all golf clubs & irons and our store staff will provide you with a completely free valuation. By trading in old or unwanted golf clubs, you’ll only need to pay the difference between the price of the new clubs and the credit given for the old ones. Each item traded in, will be independently valued and will be dependent upon the current condition and age of the clubs. If trading in irons, the full set, of at least 7 irons, must be presented. The items you trade in must be genuine and may be checked for authenticity, if not previously purchased from american golf. Please note you can only trade in like-for-like items i.e. trade in your old irons, against a new set of irons.